Badge Sign Types USA Custom - Stamps Signs Badges. Customized, laser engraved or full color. Design online! 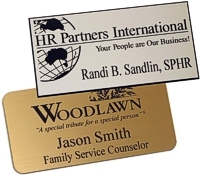 "Two Color" name badges / signs are basic in design and economical. The design, text or even logos are engraved into a special plastic / acrylic surface leaving the base color and cutting into the material to reveal the second color. Engraving may be done with a high rpm rotary or with a laser for greater detail. There are a wide variety of color combinations available. Digital Full Color badges / signs are printed directly onto the material with a specifically designed digital ink printer. The designs are imported or laid out with graphics software which in turn sends the complete, full color image to the printer. Base material for this is generally white for correct colors, although silver and gold are available for badges. Dye-Sublimated badges / signs. Similar results to full color digital direct printing, sublimation uses heat and pressure to transfer a design from special ink printed paper into the material surface. Sublimated colors are brighter and deeper and include material variety of acrylic, board and metal. Special shapes may also be laser cut to create truly unique badges. BROWSE and SHOP our variety of CUSTOM SIGNS or CUSTOM NAME BADGES online now.